French Fridays with Dorie In Which I Ponder Phyllo: Bane of My Existence or Harbinger of Zen Meditation? Well, and here we are again! I tell you, I am loving this French Fridays with Dorie thing. Everyone has been so wonderful and I am really enjoying being involved in something like this. I joined this group because I was haphazardly going through the cookbook and I desired something a bit more ordered. This? Perfect! This week: A Moroccan chicken potpie-ish dish called Chicken B’stilla. I’ll start off by saying that this is not out of my comfort zone. It’s more that I just don’t make Moroccan food very often. I read the P&Q post and saw that some people were asking about wine pairing. Well, I contributed, though a bit late, and mentioned that I do like Rhône Varietals with Moroccan food–but not just any old Rhône varietal. I prefer Mourvèdre first, then (maybe) Grenache. I was thinking all about the wines and what would pair best, etc., and then I came up with MY BEST PLAN EVER! Instead of going out to dinner like we were supposed to, I’d make the B’stilla one day earlier than planned AND I’d open up 3 or 4 different bottles of wine so we could compare! Tell me: what is the downside here? So, I made some phone calls and that became the plan. Let me tell you, it smelled really good in my kitchen. With the next step, when I braised the chicken, the aromas became more pronounced and I could even smell them outside (it was a lovely 75 degrees here, by the way). Mmmmm. 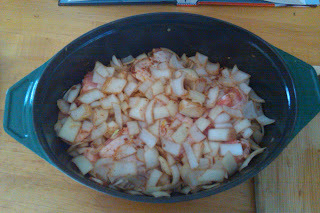 I made the mixture of chicken and onions, and then made the sauce. I followed Katrina’s suggestion on the P&Q. It’s something I know to do, but would’ve just blindly followed the recipe anyway (yes, even after what happened with the cake last week). She mentions that you need to temper the eggs, so as I madly whisked the eggs and honey I added in 1/3 of the broth reduction in a thin stream until it was all incorporated. Then I added all of that in a thin stream to the rest of the reduction still in the hot pan on the stove. That way, I didn’t have any scrambling of the eggs when they were added to something that was super hot. One more thing: I made sure my eggs were room temperature so that it would minimize the temp difference as much as possible. Yes, my stovetop is dirty. I hang my head in shame. Then, my chicken and sauce mixture. At this point, I would’ve stopped and finished the rest the next day. Instead, I carried on. It was for science, right? Well…the science of wine…? Now, though. Now is when we come to the philosophical questions inherent in any dish that uses phyllo/fillo/filo dough. I think many of them are unanswerable. For example: is there any package of phyllo dough that doesn’t have at least one sheet that will rip no matter how careful you are? If we find said perfect package, have we reached nirvana? I, personally, have a love-hate relationship with the stuff. I love it and its buttery, flaky goodness. I hate it because there’s always at least one sheet that rips no matter how carefully I do all of the damp towel, open like a book, whatever else that they tell us to do. I love it because even with all of that it’s fairly forgiving. I hate it when I’m worried about it not being forgiving while I’m in the thick of preparing it. Ultimately I have decided that I should approach it in a more zen-like manner. Phyllo will do these things–it will rip and look ridiculously rumpled and unprofessional–and that is okay. I shall take it in stride, but still remain focused. In the end, I’d much rather contemplate phyllo and its issues than all of my regular stressors. So, there it is. With all of that said, I still got irritated. HA! Here’s my finished B’stilla base, wherein 2–yes, 2 of the 4–of those be-damned sheets ripped! The next part was kind of fun! I used a pan lid as a guide to cut a large circle for the top crust and tucked it in like making a bed. Or something. With a light sprinkling of cinnamon-sugar just before going into the oven. I then had to wait 40 minutes. By this point, I think my husband had fallen asleep in front of the TV and I was starving. Those of you in this group know–this is not really difficult to make, it just takes a lot of time! But, then! Oh, then! The timer went off and it smelled sooo good. And it was pretty. While that cooled off for 5 minutes, and while my husband wandered in looking groggy (and then began salivating all over the pie) I made the lemon-steamed spinach recipe as a side. The result? YUMMY! The B’stilla is really a wonderful dish and it’s so rich that you don’t have to eat too much of it. Also, that lemon-steamed spinach is really great. I’m not a huge fan of steamed spinach, but this was the best I’ve ever had. Now that’s done, WHAT ABOUT THE WINE? You’ll have to see the WINE POST! Also, in the US, the area that has become best known for its Rhone Varietals is California’s Central Coast, extending from Paso Robles (and even Monterey, depending on who you’re talking to) in the north and Santa Barbara in the south. There are a profound number of microclimates in the region, with a huge array of wines being made from French and Italian grapes, but suffice it to say that they distinguish themselves from Napa/Sonoma’s primary emphasis on Bordeaux varietals. I opened three wines: a Malvasia Bianca from Palmina Cellars; a 2007 Alto Moncayo Garnacha; and a 2006 Mourvèdre from Carina Cellars. I chose the Malvasia Bianca because it has the florals and fruity aromas that are also characteristic of a dry Riesling. The wine went okay with the food, but I’d have preferred something drier. I could tell there was a fair amount of residual sugar in this, at least to my taste, and together with the sweet spices in the B’stilla, it made everything seem really sweet. At one point, my husband was saying how we wasn’t sure about this dish because it was “so sweet.” I pointed out that the only sugar in it was on top, and that was very little! I surmised that it was all the “sweet” spices–cinnamon and ginger–that our brains associate with sugar that was causing him to say it was sweet. It’s the same thing when people sip wine and they say, “I don’t like sweet wine” when the wine is actually quite dry. They’re tasting the fruit and mistaking it for sugar. This Alto Moncayo Garnacha runs about $45. They have a lower version for about $20 (Veraton) and the ultimate version costs about $125 (Aquilon). We’ve found that the middle one has the best Quality-Price Ratio. It’s really one of our favorite wines. Alto Moncayo has some excellent fruit aromas that are also available on the palate–blackberry, and other candied dark fruits–and the acidity seems to be teetering right where it’s a great sippy wine as well as a fine food wine. There’s some oak, though not overpowering, and there’s also a bit of minerality that at times lessens the power of the fruit (this is not a bad thing). We’ve had this in our “cellar,” the part of a spare room closet that can hold our cases of wine, for at least 3 years. I decanted it for 2 hours before dinner. This wine had some nice fruits and florals, blackberries and violets, and some smoky/tar-y stuff going on, but also had some nice spice with the pepper, cloves, and vanilla. A nice long finish due to the tannins. I really like Mourvèdre in general and I think it’s pretty darned unappreciated. The Garnacha was nice, but frankly all of the fruit together with the sweet spices of the B’stilla made it all a bit one-note for me. I wanted some more complementary flavors. The Mourvèdre had the fruit there, but with the added smoke and spice (as well as that looooong finish), really kicked it over the top. We both agreed that Mourvèdre is just right for Moroccan chicken dishes. YAY! If you can find a Mourvèdre, you might want to give it a try. With food, though, so that you can better appreciate it. Some people are turned off by some gaminess on the nose, so be aware of that, too.